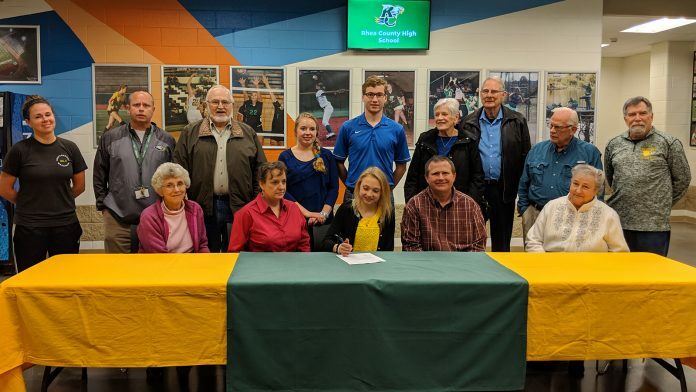 Evensville, TN — Rhea County High Track and Cross Country long distance runner Lesley Green had scholarship signing ceremony with University of Tennessee at Chattanooga recently at Rhea County High School in Evensville. Lesley had friends, coaches, teammates, family and school officials and teachers attending the ceremony that is held in the main open area of the school. Ceremonies are held there so students can be aware of the signings, which happen quite often for Rhea County High School. Lesley still has a spring season of track to run before finishing up her running career at Rhea County High School. Lesley has achieved All-State in Cross Country and Track over the last three years. Beside earning honors on the athletic fields, she is also a very good student. Lesley will look to manor in business management and would like to be involved in the running field after graduation from UTC. During the signing ceremony, Lesley took time to thank all those who have contributed to her success and supported her along the way. She thanked family, coaches and teammates for being there along the way. Lesley’ sister Kiley was the reason, Lesley ended up the track team. Kiley a solid runner who also ran long distance but filled in wherever coach Holder needed her, convinced her sister that she should be on the team. During her face race with the team, she realized that this was something she enjoyed and would want to pursue. This was good news for the team. Lesley ran a 22:15 time in her first 5K race and finished her career with an 18.05. Lesley began her career as a good runner and finished her cross country as a great runner and look for great things fro Lesley in the upcoming track season. Coaches Steffan Holder and Amy Baird each echoes the same message regarding Lesley. Hard work, showing up early, staying late and remaining steady from day one. As a runner, she has the ability to be a great runner without the kick that some runners have, but that is just her personality. Starts strong, runs strong in middle and finishes strong. She has earned many awards and accolades during her time, including All-State awards for both Track and Field and cross country. She has been All-District, All-Region and performed well in after season competition. She is team all time record holder for 1600 and 3200 in track and 5k in cross country and she still has chance to break both her track records this spring.